For the second year Aquabio have successfully encouraged their employees to ditch their cars and instead use pedal power! Employees of Worcester based company Aquabio face the normal challenge of the rush hour each morning and evening as they make their journey to work. Some have chosen to commute to work by bike, as a means of avoiding the traffic jams, and the stress that congestion brings. Seeing the true benefits that cycling can have, whether it be commuting to work or for leisure, Aquabio created SHIFT to encourage others to start cycling, and in the process help the environment and reduce the amount of traffic on the roads. SHIFT (Sustainability and Health in Future Transport) was created in 2017 as part of Aquabio’s corporate social responsibility campaign, to reduce emissions, improve air quality and support the physical and mental health of their employees. The SHIFT initiative involves Aquabio employees logging their kilometres using Strava, while cycling for work or leisure. For every kilometre cycled, Aquabio donates 2.5 pence to a nominated charity, which is accumulated and presented at the end of each year. Since the scheme was introduced the number of regular cycle commuters has doubled, with 21 Aquabio employees registered a ride in 2018, and over 1000 commutes to the office and sites. The scheme has resulted in a donation of £927.30 split between two UK cycling charities, Sustrans and Cycling UK. Sustrans is the charity making it easier for people to walk and cycle. They connect people and places, create liveable neighbourhoods, transform the school run and deliver a happier, healthier commute. 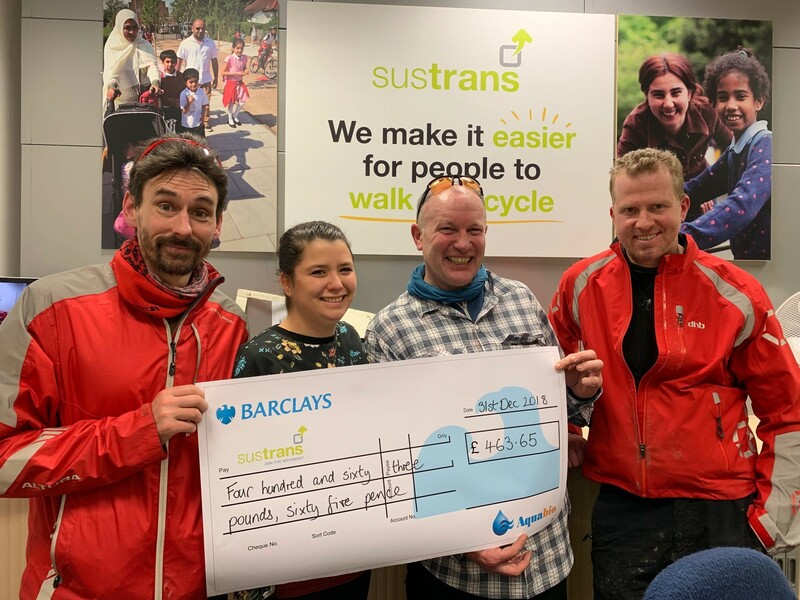 To support their charitable aims, Sustrans offers a range of services to employers who want to embrace the benefits of active travel, with their expertise in behaviour change, community engagement and improving the built environment. Since the SHIFT initiative was launched, Aquabio employees have collectively cycled over 80,000 km, which based on an average of 118g/km of CO2 (2017 European average for new cars) equates to an impressive 9,440 kg of CO2 that would otherwise have been released into the atmosphere. Going from strength to strength, in 2018 Aquabio was awarded the Red Bull Extra Mile Workplace Awards for Best Small Business, which recognises workplaces who support active transport, including running, cycling and walking to work. With over 2000 commutes since the launch of SHIFT, Aquabio shows no signs of slowing down the enthusiasm or pace, and benefits it has brought to their employees, the environment and nominated charities. Aquabio – which operates from its headquarters in Hallow, Worcestershire – was established in 1997 and is a European Leader in industrial water treatment and reuse back to drinking water. The company has pioneered the implementation of water recycling within a wide range of industries including food and drink, bio fuels, pulp and paper, landfill and leachate and pharmaceuticals. This entry was posted in Charity, SHIFT, Social Responsibility. Bookmark the permalink.